We need an inquiry into food banks: My column in today’s Guardian. Food banks are not new, nor news. Commenters on all sides are quick to point out that they first sprang up under the last Labour government, but the need for them has increased dramatically since the introduction of the bedroom tax in April, and harsh sanctions for benefit claimants. The latest figures from the Trussell Trust show that demand for food banks is still increasing. In George Osborne’s ‘war on welfare’, the only casualties are those at the very bottom. But this is not a war. It is an assault against the unarmed, a massacre of hope and dignity. 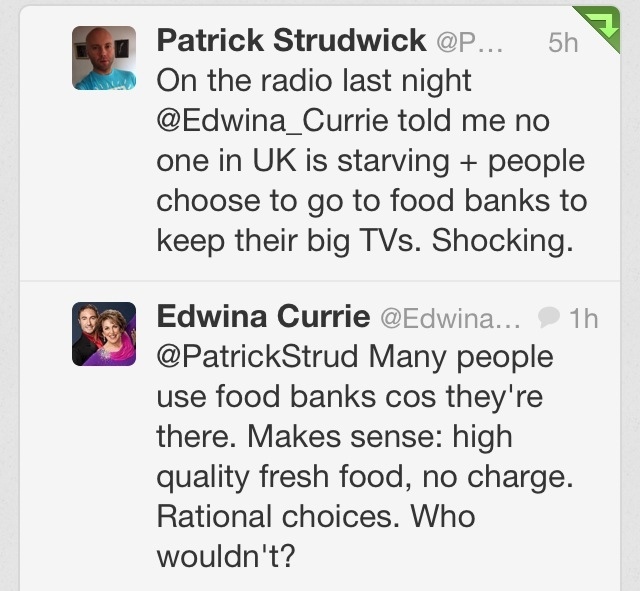 Edwina Currie recently commented that she had “no sympathy” for food bank users, that they were just “rational” opportunists. I attempted to point out that food bank users had to be referred by a health visitor or social services or other agency for help, but she refused to hear it.